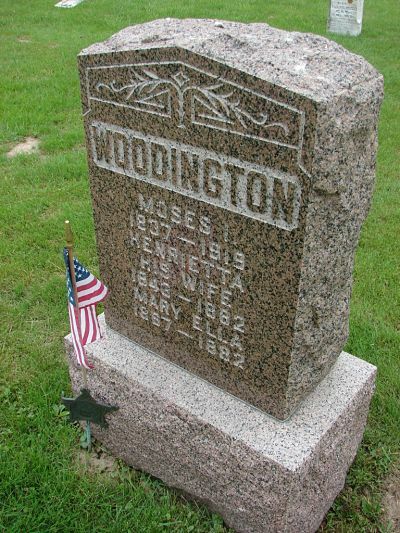 My second great-grandmother, Henrietta (Munson) Woodington died on this day, September 8, in 1882 at the age of 39. According to the 1870 U.S. Census information*, Henrietta was born in Ohio, maybe in Trumbull County where her parents, Amos Munson and Mary Ann Kearney, had married. According to her gravestone, Henrietta was born in 1843. At some point, she had moved to Grant County, Wisconsin and, on December 16, 1859, when she was about 16 years old, she married** Moses Woodington. The couple had six known children: Furman Clarke (1860 – 1946), Lily Bell (1862 – 1872), George Franklin (1864 – 1926), Mary Ella (1867 – 1882), Virginia “Jennie” Lee (1871 – 1928), and Walter (b. 1877, death date unknown). Henrietta died at a young age and their daughter, Mary Ella, died just four weeks later at the age of 15. Unfortunately, neither of their death certificates in Grant County, Wisconsin list a cause of death, so we will not know with certainty. I wondered if there were any epidemics going through at that point in history that may have taken both women. According to the Report of the State Board of Health for the State of Wisconsin in 1882 (which can be found in Google Books), there was a milder smallpox epidemic that year even though a more primitive version of the vaccine was available. Mike Nichols, in a Milwaukee Journal-Sentinel article, wrote of a diphtheria epidemic that killed five young daughters in the spring of 1882. Diphtheria was terrifically contagious and dangerous. Nichols wrote that sometimes even the undertaker would not handle the bodies. Another curiosity: the death certificates were recorded several years after their deaths, in 1896. I do not know what this all means except that I am left with questions. * Source Citation: Year: 1870; Census Place: Cassville, Grant, Wisconsin; Roll: M593_1716; Page: 87A; Image: 178; Family History Library Film: 553215. **Source Information: Ancestry.com. Wisconsin Marriages, pre-1907 [database on-line]. Provo, UT, USA: Ancestry.com Operations Inc, 2000. Original data: Wisconsin Department of Health and Family Services. Wisconsin Vital Record Index, pre-1907. Madison, WI, USA: Wisconsin Department of Health and Family Services Vital Records Division.